Two important aspects of guitar playing that I don’t cover in my guitar theory materials are rhythm and technique. If you want to improve your timing, sharpen your technique, or get inspired by new ideas, then read my book Guitar Rhythm and Technique For Dummies and work with the online audio and video it features. This book, which I authored for the famous For Dummies brand by Wiley, gets into the details of time signatures, note values, slash notation, strum patterns, articulations, picking mechanics, finger picking, harmonics, slide guitar, whammy bars, alternate tunings, and more. 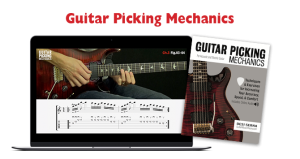 There are lessons suitable for guitar players of all levels including beginner, intermediate, and advanced. 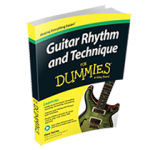 Listen to a free Guitar Rhythm and Technique For Dummies audio track at the link below to hear samples of what you learn in the book. 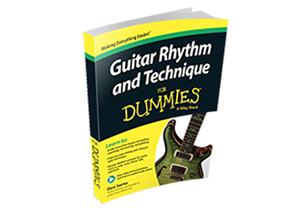 Guitar Rhythm and Technique For Dummies is available at all major book retailers, including Amazon below. Books only are also available for Barnes and Noble Nook, Apple iBooks, and Google Play. 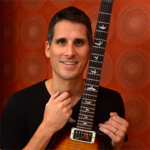 In addition to this rhythm and technique course, I authored Guitar Theory For Dummies. Click on the link to learn more about it. If you’re looking to improve your picking technique specifically, including improving your picking accuracy, speed, and comfort, see my course, Guitar Picking Mechanics.